What do you get when you have a classically-trained musician who spends years working with roots acts like Great Lake Swimmers? 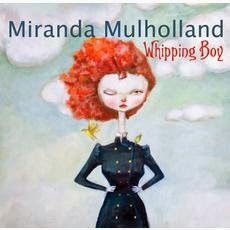 Well, you get Guelph-native Miranda Mulholland and her debut solo album Whipping Boy (out May 13th). The title track opens the album and Mulholland seems determined to show off everything right away. Her vocal range is impressive, due in no small part to her opera background, and it's accompanied by an unhurried and lush roots/folk arrangement. That laid back type of jangle rears its head again on "Vanity's Disguise". Twang and lounge work surprisingly well together on the exceptional "Hold My Tongue". It also features the most well-crafted and charming lyrics on the record. It's hard to resist a line like 'you can hold your drink better than I can hold my tongue'. The melodic folk is hit or miss. It works on "The Palms and the Pines", but there's not enough intrigue to either "Remember" or the minstrel-like "Emmaline" to hold the listener. An East Coast, Celtic spirit comes through on the instrumentals "Shiloh" and "Bar Rage". The latter in particular has an Ashley MacIsaac type fiery fiddle flair. "How Many Times" sounds a bit out of place in the context of the rest of the record, but its cutesy Zooey Deschanel-esque vocals are irresistibly charming. It's clear that Mulholland is a proficient musician. Whipping Boy is a bit of an uneven effort, but future records should see the jittery nature work its way out. Miranda Mulholland plays the Dakota Tavern in Toronto on May 14th. Best tracks: "Hold My Tongue", "How Many Times"